On the day after Thanksgiving, Scott and I were getting bored sitting around waiting for our wives to return form shopping so we took Janice's Jeep to a place near Lewisburg called Wooly's off road park. 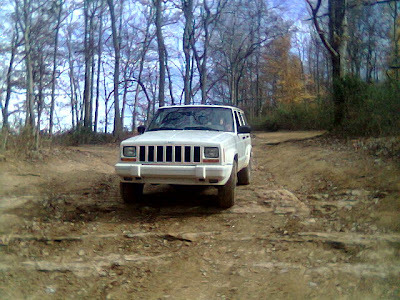 We felt a little out of place in her stock Jeep with her Motives Cosmetics ads on the rear hatch but we knew that a stock jeep is very capable of running mild trails. The folks there were very nice and friendly and told us which trails they recommended. We signed the waiver and paid our $10 entry fee. I drove around a bit and explored the east side of the park. There was lots to see there. We watched a couple of wranglers tip toe around on some of the rocks there. As we were getting ready to cross the road to the west side of the park Scott was driving when we spotted the Wranglers working their way down what looked like a tricky hill. I quickly scouted it and saw it was easily passable in JeepGirls Jeep and I waved Scott on. He made it down with very little drama. In fact remarked how easy it was. So I told him to turn it around a go back up. 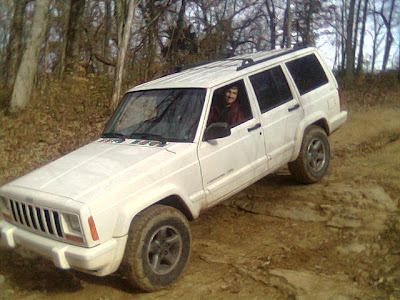 Even with both sway bars installed, and full street pressure in the tires, he made it up the hill. He only stopped once but a little bump got him over the rock. Not a Neal Hoover bump, just a little bump. We explored some of the west side of the park but we got confused at a five way intersection. It was starting to get dark so we turned around and I let Scott drive back to the parking lot. Wooly's is defiantly due for a revisit. It looks like a good safe place for Scott to drive his Woody Wagoneer. There are also some very interesting looking hills that I want to try Scuffy on. I guess I will have to fix my winch before Christmas. Jeepgirl? why you chose this name? The back of my Jeep has a sticker on it that says. "Jeep girls do it in the mud." After my friend Jen saw it she started calling me Jeep girl and it stuck. As the son of a "Jeep girl", I fully understand their love for their Jeep! You go girls! Nice post jeep girl.I will wait for some more like this.